Handcrafted out of genuine hardwood and tournament-quality materials made to last for years, our shuffleboard tables are guaranteed to make a statement in your home. 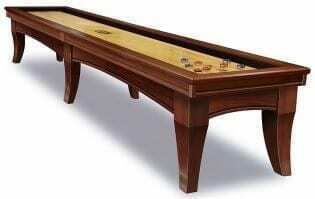 We carry our own styles of shuffleboard tables in our Generations line, that are custom made and completely original. We also have tables from California House, Hudson, Olhausen, and Brunswick- some of the top brands in the industry.